A new pouch-size variation of Kroger snacks is now out there. Still 6 pouches, but smaller oz. size. I suspect this will also be availble for Fred Meyer and Ralph's. Pics when I receive it. I stopped by a small local shop last week that advertises having a few American confectionery and food items, but they didn't have any Star Wars ones (they do have over-priced Twinkies). I still haven't yet been to the American specialty store that's over the other side of the city - they have food items and other things, including toys. Cool. Thanks for keeping an eye out Buzz. Found a new, even smaller, box of Kids Classics snacks at Dollar Tree today. 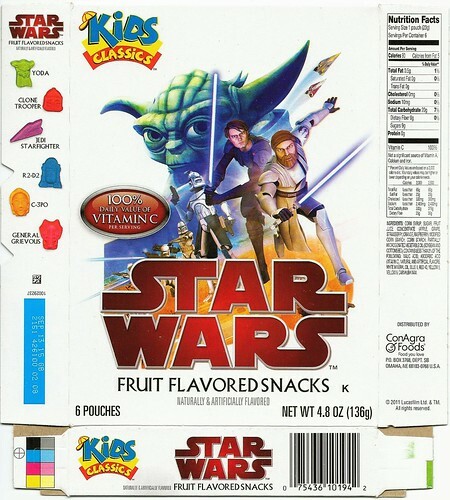 Same Clone Wars box, but this time with a 2011 copyright date, and containing five pouches, total of 4.0oz. May have a couple other updates I need to make. Hope to do some scanning this weekend. Adding photos of new box sizes to Clover Valley (ANH box), Hy-Vee (5 pouches), Kids Classics (5 pouches, 4.0oz), and Kroger (6 pouches, 4.8oz). Pictures in their respective posts above. That brings us to 41 confirmed boxes...with more out there I'm sure. I'm still on the hunt for new boxes. With all the new size variations out there, I may need newer versions of existing boxes. I anyone has found boxes for me in the past, you may be able to find new ones locally. I'll still gladly pay for two or more of each new box. Found a new Kroger box. This time it is blue, and has ANH art on one side, TPM art on the other. Added to Kroger listing above, but here are the pics as well. Also found a new 4.8 oz 6 pouch box of Hy-Top online. Will post pics once I acquire one. If you have a list of ones you're looking for I'll keep an eye out for them. Well....I don't really have a list of ones I need (there are only three confirmed needs right now, although I know there are others). It's a matter of finding a new size or package and determining I don't already have it. I'll post a list of the three known needs. Then I'll post a list of what I have. Easiest way for me at this point is to just print out the list and compare. They've made it difficult as the sizes change. For example, Kids Classic has gone from 5.0oz 6 pouches, to 4.5oz 5 poouches, to 4.0oz 5 pouches. 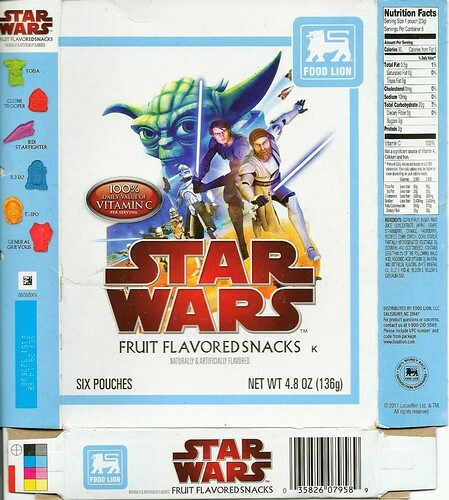 The boxes are almost the same, but the sizes and pouch quantities have changed. And at this point, the majority of brands I fear have all downsized. Meaning anything I have previously acquired I need to reinvestigate again. Some are easy to spot though. The new Kroger one, for example, had a completely new look, making it an obvious mark when compared to previous packaging. Thanks for offering to hunt for me. 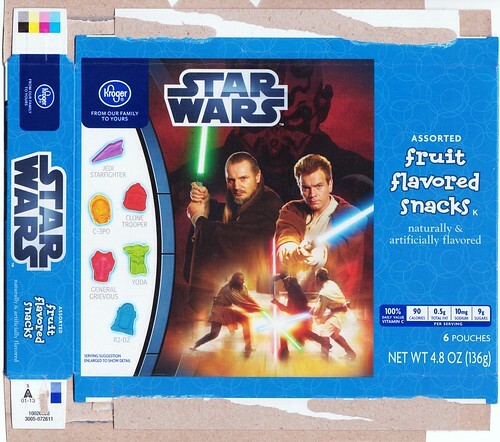 I definitely need Clone Wars boxes that say GIANT (not Giant Eagle), Flavorite, or Shaw's. I fear all three of these boxes may have been phased out at this point. First page has been updated with a new master list of boxes. Currently up 67 packages documented. Big thanks to all the Bothan Spies and collectors out there working together to track these. 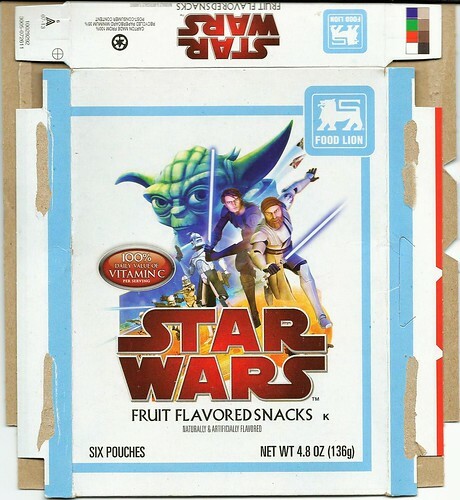 Also, added scans of a new Stater Bros box size in the Stater Bros post. 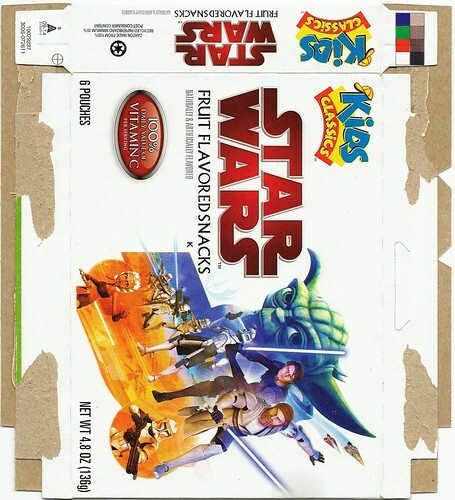 Been a slow year for Fruit Snacks.....although a new pouch featuring ANH artwork (simialr to the pouch with TPM artwork) is showing up on eBay. Have not found it in stores yet, although Walmart near the checklanes is a likely target. UPDATE: Got an ANH pouch on the way. According to the seller, he obtained them at closeout from a local Amish grocery store when they were nearly out of date. So, looks like these have come and gone, and may be difficult to find at retail now. Found a new size of Kids Classics at Super Target in Lousiana...regular Targets don't seem to carry them. 6 pouches, 4.8oz, 2011. New size of Food Lion obtained: 6 pouches, 4.8oz, 2011. 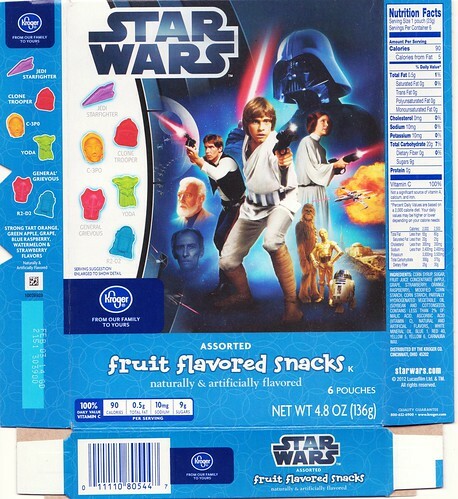 Yesterday I noticed that my daughters yogurts now come in 4 different Star Wars character packagings. Okay.....very interested in that. PM sent.